Fabry disease is an X-chromosome linked hereditary disease that is caused by loss of function mutations in the α-galactosidase A (α-Gal A) gene, resulting in defective glycolipid degradation and subsequent accumulation of globotriaosylceramide (Gb3) in different tissues, including vascular endothelial cells and neurons in the peripheral and central nervous system. We recently reported a differential gene expression profile of α-Gal A(−/0) mouse dorsal root ganglia, an established animal model of Fabry disease, thereby providing new gene targets that might underlie the neuropathic pain related symptoms. To investigate the cognitive symptoms experienced by Fabry patients, we performed one-color based hybridization microarray expression profiling of prefrontal cortex samples from adult α-Gal A(−/0) mice and age-matched wildtype controls, followed by protein-protein interaction and pathway analyses for the differentially regulated mRNAs. We found that from a total of 381 differentially expressed genes, 135 genes were significantly upregulated, whereas 246 genes were significantly downregulated between α-Gal A(−/0) mice and wildtype controls. Enrichment analysis for downregulated genes revealed mainly immune related pathways, including immune/defense responses, regulation of cytokine production, as well as signaling and transport regulation pathways. Further analysis of the regulated genes revealed a large number of genes involved in neurodegeneration. The current analysis for the first time presents a differential gene expression profile of central nervous system tissue from α-Gal A(−/0) mice, thereby providing novel knowledge on the deregulation and a possible contribution of gene expression to Fabry disease related brain pathologies. Fabry disease (FD) is an X-chromosome linked hereditary disease that belongs to the group of lysosomal storage disorders. It is caused by loss of function mutations in the lysosomal α-galactosidase A (α-Gal A) gene that result in defective glycolipid degradation, and subsequent accumulation of globotriaosylceramide (Gb3) in different tissues, including vascular endothelial cells and neurons (Desnick et al., 2001; Gal et al., 2006; Saito et al., 2011; Bangari et al., 2015). Incidence rates for FD span from 1:37′000 for the classical phenotype to 1:3′100 for a late-onset disease variant, with males being more affected than females (Spada et al., 2006; Mechtler et al., 2012). Nevertheless, also heterozygous females show variable expression of α-Gal A caused by random X-inactivation, which leads to major organ involvement (Wilcox et al., 2008). One of the earliest symptoms of FD is small-fiber neuropathy, which leads to pain attacks already in childhood and is associated with accumulation of Gb3 in sensory neurons of dorsal root ganglia (DRG) (Germain, 2010; Bangari et al., 2015). In addition to neuronal accumulation in the peripheral nervous system, Gb3 deposits are also found in neurons and other cell types of the central nervous system (Khanna et al., 2010; Tuttolomondo et al., 2013a,b). Often, those glycolipid deposits lead to alterations in cerebral vessels and the formation of microstructural damage (i.e., microbleeds) in different brain regions (Tagliavini et al., 1982; Reisin et al., 2011; Paavilainen et al., 2013; Kono et al., 2016). In line with these pathologies, different forms of cognitive deficits have been reported in FD patients, spanning from higher prevalence of depression and anxiety to impairment of information processing and attention (Schermuly et al., 2011; Bolsover et al., 2014; Sigmundsdottir et al., 2014), as well as impaired long-term verbal memory (Cocozza et al., 2018). These are reflected to some extent in a transgenic FD mouse model which shows increased anxiety-like behavior (Hofmann et al., 2017). In a recent microarray profiling study of DRGs, we provide the first report on changed gene expression in neuronal tissue from a mouse line with a null mutation of α-Gal A modeling FD (Kummer et al., 2017). Besides the identification of numerous regulated genes, enriched pathways are implicated in general neuronal dysfunction, for example G-protein coupled receptor activity and neuropeptide signaling that might affect excitability and neuronal activation in FD (Kummer et al., 2017). The above mentioned cognitive deficits seen in FD patients and mice may be related to such changes in neuronal excitability or compromised receptor activity in higher brain regions, most probably in the prefrontal cortex (PFC), as the major deficits reported from FD patients refer to attention and executive functioning. 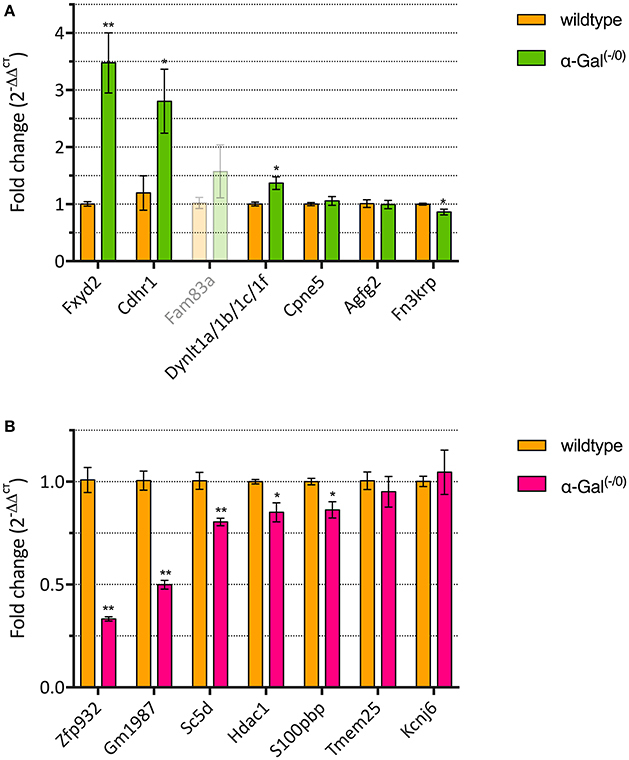 We therefore set out to explore neuronal gene expression changes associated with the loss of function of α-Gal A in a particularly important brain area and link it to the reported cognitive deficits, by performing mRNA microarray expression profiling of PFC tissue samples from adult male α-Gal A(−/0) mice, followed by qPCR validation and in depth bioinformatics analyses of protein-protein interactions and pathways. Male α-galactosidase A(−/0) (α-Gal A(−/0); background C57BL/6; kindly provided by Dr. A. Kulkarni, National Institute of Health, NIDCR, Bethesda, USA) (Ohshima et al., 1997) and wildtype C57BL/6J mice (age 20-24 weeks) were inbred and housed under specific pathogen-free (SPF) conditions. For microarray expression profiling mice from the separate inbred colonies were used, whereas for RT-qPCR validation, α-Gal A(−/0) mice backcrossed with wildtype C57BL/6J mice and wildtype C57BL/6J mice were used to control for inbred colony effects. Animals were maintained at constant room temperature of 24°C on a 12h light/dark cycle with lights on from 07:00 to 19:00 and had ad libitum access to autoclaved pelleted food and water. All animals were treated in accordance with the Ethics Guidelines of Animal Care (Medical University of Innsbruck), as well as the European Communities Council Directive of 22 September 2010 on the protection of animals used for scientific purposes (2010/63/EU), and approved by the Austrian National Animal Experiment Ethics Committee of the Austrian Bundesministerium für Wissenschaft und Forschung (permit number BMWF-66.011/0054-WF/V/3b/2015). For microarray expression profiling four adult mice per group, and for RT-qPCR validation six adult mice per group were deeply anesthetized with isoflurane and euthanized by decapitation. Brains were removed, prefrontal cortices dissected and flash-frozen in liquid nitrogen. Samples were stored at −80°C until further processing. Genome-wide expression profiling was carried out by IMGM Laboratories (Munich, Germany) using Agilent SurePrint G3 Mouse GE 8x60K Microarrays in combination with a one-color based hybridization protocol. Microarray signals were detected using the Agilent DNA Microarray Scanner. Total RNA including small RNAs was isolated using the miRNeasy Mini Kit (Qiagen) according to the manufacturer's instructions and eluted in 40 μl RNase-free water. RNA concentration and purity was determined on a NanoDrop ND-1000 spectral photometer (Peqlab). Samples were analyzed using the RNA 6000 Nano LabChip Kit (Agilent Technologies) on a 2100 Bioanalyzer (Agilent Technologies). For mRNA analysis, total RNA samples were spiked with in vitro synthesized polyadenylated transcripts (One-Color RNA Spike-In Mix, Agilent Technologies), reverse transcribed into cDNA and then converted into Cyanine-3 labeled complementary RNA (Low Input Quick-Amp Labeling Kit One-Color, Agilent Technologies) according to the manufacturer's instructions. cRNA concentration, RNA absorbance ratio and Cyanine-3 dye concentration were recorded using a NanoDrop ND-1000 UV-VIS spectral photometer, and quality of labeled cRNA was analyzed using the RNA 6000 Nano LabChip Kit (Agilent Technologies) on a 2100 Bioanalyzer (Agilent Technologies). Following cRNA clean-up and quantification, Cyanine-3-labeled cRNA samples were fragmented and prepared for one-color-based hybridization (Gene Expression Hybridization Kit, Agilent Technologies) and hybridized at 65°C for 17 h on Agilent SurePrint G3 Mouse GE 8x60K Microarrays. After hybridization, microarrays were washed with increasing stringency using Triton X-102 supplemented Gene Expression Wash Buffers (Agilent Technologies) followed by drying with acetonitrile (Sigma). Fluorescence signals were detected on an Agilent DNA Microarray Scanner and extracted using feature extraction software (Agilent Technologies). The data discussed in this publication have been deposited in NCBI's Gene Expression Omnibus (Edgar et al., 2002) and are accessible through GEO Series accession number GSE110645 (https://www.ncbi.nlm.nih.gov/geo/query/acc.cgi?acc=GSE110645). Total RNA was extracted using peqGOLD TriFast reagent (Peqlab) according to the manufacturer's instructions. The quality and quantity of RNA was evaluated using NanoDrop 2000 (Thermo Scientific). Reverse transcription of mRNA was performed as previously described (Kummer et al., 2017). Genes of interest were analyzed by RT-qPCR using the following TaqMan Gene Expression Assays (Thermo Fisher Scientific): Mm00499982_m1 (Cdhr1), Mm01207095_g1 (Agfg2), Mm01297785_m1 (Cpne5), Mm00839582_m1 (Dynlt1a/1b/1c/1f), Mm00723335_m1 (Fam83a), Mm00619552_m1 (Fn3krp), Mm00446358_m1 (Fxyd2), Mm03646971_gH (Gm1987), Mm02391771_g1 (Hdac1), Mm01215650_m1 (Kcnj6), Mm01188211_m1 (S100pbp), Mm00555295_m1 (Sc5d), Mm00503605_m1 (Tmem25), Mm00836474_m1 (Zfp932), Mm00446968_m1 (Hprt), Mm01352363_m1 (Sdha), and Mm00441941_m1 (Tfrc). Experimental procedures were performed according to the TaqMan Gene Expression Assays protocol. The reactions were loaded on MicroAmp Fast Optical 96-well reaction plates (Thermo Fisher Scientific) and placed in the Applied Biosystems 7500 Fast Real-Time PCR System (Thermo Fisher Scientific). The PCR cycle protocol used was: 10 min at 95°C, 40 two-step cycles of 15 s at 95°C and 1 min at 60°C. Each sample was run in duplicates alongside non-template controls. Threshold was set manually at 0.1 and threshold cycle (CT) was used as a measure of initial RNA input. Relative fold changes in gene expression were calculated using the 2−ΔΔCT method. All fold changes were expressed relative to the respective expression in wildtype mice and analyzed using Welch's t-test. Three genes (i.e., Hprt, Sdha, and Tfrc) were used as reference genes. All three reference genes were found to be stably expressed in both groups of animals, as indicated by geNorm, Normfinder, and Bestkeeper software packages. GeneSpring GX 13.0 analysis software (Agilent Technologies) was used to normalize and analyze the microarray raw data. Data were normalized using non-parametric quantile normalization. Groups were compared using Welch's approximate t-test (unpaired unequal variances) and p-values corrected for multiple testing using the algorithm of Benjamini and Hochberg (Benjamini and Hochberg, 1995), controlling for false discovery rate (FDR). Differential expression between the two groups was determined by calculating fold changes of the averaged normalized expression values. Significantly regulated mRNAs were identified by applying filters on fold changes (absolute fold change ≥ 1.2 or ≥ 2) and p-values (p ≤ 0.01). Gene expression data were further processed by R statistics statistical software package (R Development Core Team, 2008) and Volcano plots prepared using R statistics ggplot library. Only genes with uncompromised hybridization values in all individual samples were used for the current analysis. Protein-protein interactions were investigated for the significantly regulated mRNAs using the STRING Database v. 10.5 (http://www.string-db.org) (Szklarczyk et al., 2017), which includes direct and indirect protein associations collected from different databases. 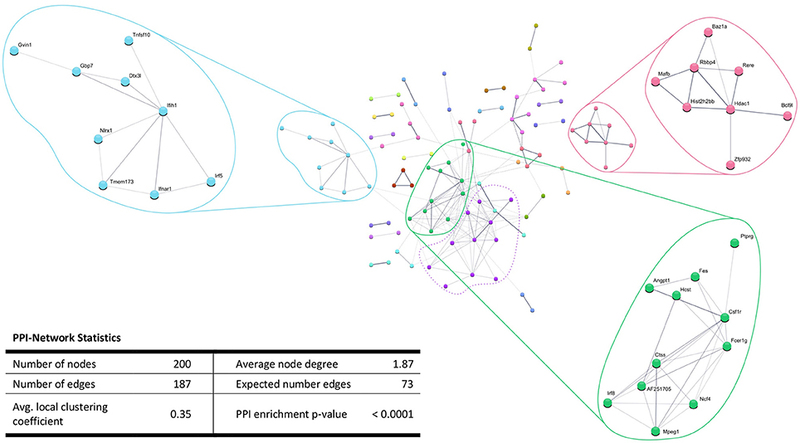 Interaction networks were prepared using medium confidence scores (0.40) and clustered using MCL clustering algorithm (inflation parameter: 3). Disconnected nodes were hidden from the network. Functional enrichment and pathway analyses were also performed using the STRING Database v. 10.5 (http://www.string-db.org). Classification systems tested were Gene Ontology and KEGG functional annotation spaces, employing Fisher's exact test followed by FDR correction for multiple testing. Only enriched pathways with FDR corrected p-values < 0.05 are reported. 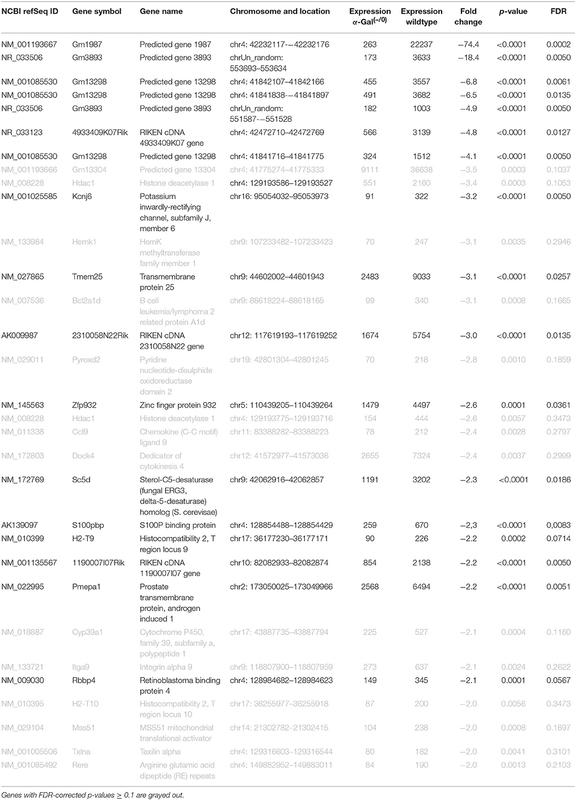 Using microarray expression profiling we found that in total 381 genes from the overall 21′393 detected mRNAs were significantly different between PFC samples from wildtype and α-Gal A(−/0) mice (criteria p ≤ 0.01, absolute fold change ≥ 1.2) (Figure 1). Of those, 135 genes were significantly upregulated and 246 genes were significantly downregulated as compared to wildtype controls. More stringent filtering (criteria p ≤ 0.01, absolute fold change ≥ 2) of the significantly regulated genes revealed an assessable number of 50 genes in total (Figure 2). 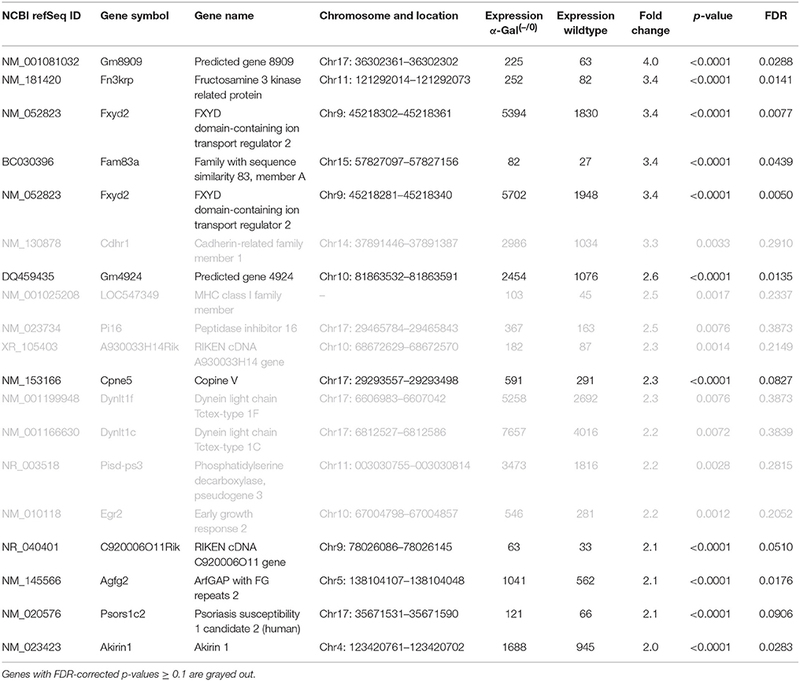 Using these criteria 19 genes were significantly upregulated, of which 11 showed FDR corrected p ≤ 0.1 (Table 1). Furthermore, 31 genes were significantly downregulated, of which 17 showed FDR corrected p ≤ 0.1 (Table 2). Protein-protein interaction (PPI) analysis (STRING Database) did not reveal clusters of interacting proteins or enriched pathways when applying the stringent filtering criteria, due to the low number of input genes. Therefore, less stringent filtering criteria (criteria p ≤ 0.01, absolute fold change ≥ 1.2) were used for PPI and enrichment analyses. Figure 1. Volcano plot of microarray data. Green color, p ≤ 0.01, fold change ≥ 1.2; labels, p ≤ 0.01, fold change ≥ 2.0; dot size represents relative expression values of wildtype mice. Figure 2. Heatmap of significantly regulated genes. Cut-off values, p ≤ 0.01, fold change ≥ 2. Table 1. Raw expression values, fold changes, and statistical analysis for significantly upregulated genes. We performed RT-qPCR analysis of the top 7 up- and downregulated genes in a separate set of PFC samples from α-Gal A(−/0) mice backcrossed with C57BL/6J mice and control C57BL/6J wildtype mice, to validate the differentially expressed genes from the microarray expression profiling. One of the upregulated genes (i.e., Fam83a) had CT-values higher than 35 and was therefore excluded from further analysis. For the remaining upregulated genes, we validated that 3/6 genes (i.e., Fxyd2, Cdhr1, and Dynlt1a/1b/1c/1f) showed significant upregulation (Figure 3A, Supplementary Table 1). Furthermore, 5/7 of the downregulated genes (i.e., Zfp932, Gm1987, Sc5d, Hdac1, and S100pbp) showed significant downregulation (Figure 3B, Supplementary Table 1). Altogether, RT-qPCR validation yielded a verification rate of 62%. Figure 3. RT-qPCR validation of up- (A) and downregulated genes (B). *p < 0.05, **p < 0.01. Performing enrichment analysis of the 135 upregulated genes neither revealed Gene Ontology processes, nor KEGG pathways. Also, PPI analysis of the significantly upregulated mRNAs revealed no significant PPI enrichment (p = 0.59; Figure 4). Figure 4. 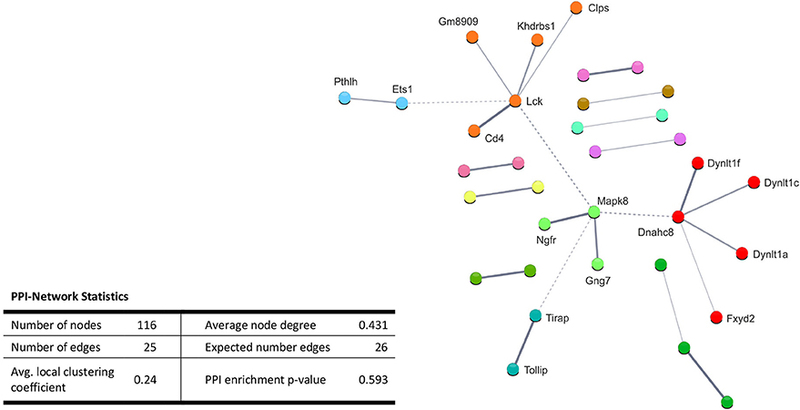 STRING database protein-protein interaction (PPI) networks of significantly upregulated genes. Cut-off values, p ≤ 0.01, fold change ≥ 1.2. Cluster analysis did not reveal any protein-protein interaction clusters. 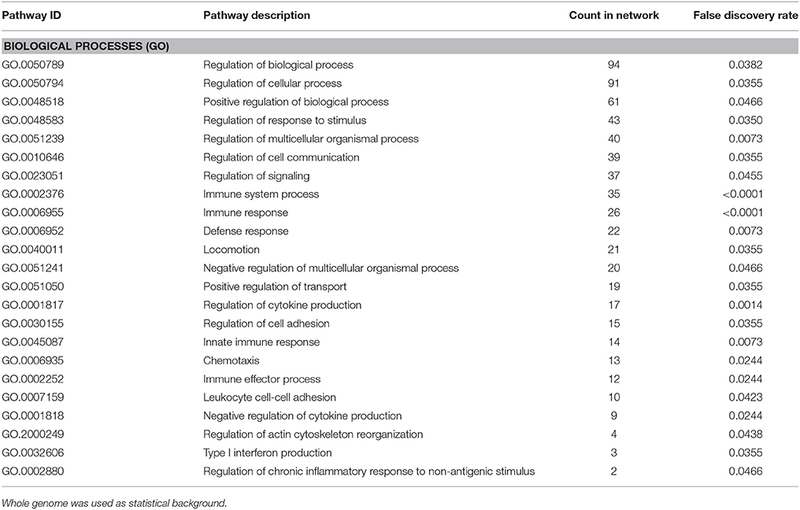 Enrichment analysis of the 246 significantly downregulated genes revealed a number of regulated pathways, including immune related pathways (e.g., immune system process, immune/defense responses, regulation of cytokine production) and signaling pathways (e.g., regulation of cell communication, regulation of signaling, positive regulation of transport; Table 3). Table 3. Enrichment-analysis for downregulated mRNAs in α-Gal(−/0) vs. wildtype mice using Gene Ontology and KEGG pathway annotations. In addition, the PPI analysis of significantly downregulated mRNAs showed a significant PPI enrichment (p < 0.0001; Figure 5). The number of actually observed edges (n = 187) exceeded the expected number of edges (n = 73) by 156%. When taking a closer look at the PPI network, three clusters of highly interconnected proteins became apparent. Enrichment analysis of these clusters showed that those genes were involved in different pathways (Table 4). The blue and green clusters were related to the immune system (e.g., immune response—GO:0006955, interferon production—GO:0032479, cytokine production—GO:0001817), whereas the pink cluster was associated with DNA modification and gene expression (e.g., gene expression—GO:0010467, DNA binding—GO:0003677). Figure 5. STRING database protein-protein interaction (PPI) networks of significantly downregulated genes. Cut-off values, p ≤ 0.01, fold change ≥ 1.2. Cluster analysis revealed four clusters of interacting proteins, of which one (purple cluster) did not show significantly enriched pathways and processes. Table 4. GO Biological processes and molecular functions of PPI-clusters from downregulated mRNAs in α-Gal(−/0) vs. wildtype mice. To link the cognitive deficits associated with FD to an impairment of cortical neuron function, we specifically screened the microarray dataset for genes related to ion channels, receptors, synapse and signaling proteins. We found that two potassium channels (i.e., Kcnj13 and Kcnj6), as well as the neuropeptide S (Npsr1) and adenosine A2b receptors (Adora2b) were downregulated (Supplementary Table 2). Validation of some of these differentially expressed genes was, however, problematic possibly due to dilution of neuronally expressed genes by genes from glial or other cell types. The delta chemokine receptor Cx3cr1 was also downregulated. Further, we found that ten different receptor tyrosine kinases (e.g., Il1rap, Il3ra, etc.) and protein tyrosine phosphatases (i.e., Ptprb and Ptprg) were downregulated. Furthermore, a number of synapse and signaling proteins were downregulated in the screen. The mRNA levels of the synaptic proteins Synaptoporin (Synpr), Synaptojanin 2 (Synj2), the active zone protein Rims1 and Snap25, as well as the signaling proteins RAS protein activator Rasal3 and the G-protein signaling modulator Gpsm3 were decreased. In contrast, the nicotinic acetylcholine receptor α-subunit 4 and the low-density lipoprotein receptor sortillin-related receptor (Sorl1) were upregulated in our screen, as were the toll-interleukin 1 receptor domain-containing adaptor protein (Tirap), the mitogen-activated proteins Mapk8 and Mapk1ip1l, and the G-protein Gng7. These findings suggest that indeed functional changes occur in the brain as a consequence of α-Gal A depletion which, may affect synaptic signaling and information processing in cortical circuits. FD patients exhibit small fiber neuropathy with pain symptoms already in early childhood, which are thought to arise from accumulation of the glycolipid Gb3 specifically in DRG neurons and peripheral nerves (Kocen and Thomas, 1970; Ohnishi and Dyck, 1974; Bangari et al., 2015; Godel et al., 2017). However, neuronal accumulation of Gb3 not only occurs in DRGs and peripheral nerves, but also in central nervous system tissues, like the spinal cord, medulla oblongata, hypothalamus, amygdala, substantia nigra, raphe nuclei, hippocampus, and cortical layers 5/6 (de Veber et al., 1992; Itoh et al., 2001; Khanna et al., 2010; Tuttolomondo et al., 2013a,b). Besides accumulation in neurons, glycolipid deposits are also found in the walls of cerebral vessels, leading to occlusion of blood vessels with malperfusion of different brain areas (Tagliavini et al., 1982; Itoh et al., 2001; Reisin et al., 2011; Tuttolomondo et al., 2013a), acute ischemia and stroke (Fazekas et al., 2013), microstructural damage and white matter lesions (Fellgiebel et al., 2012; Paavilainen et al., 2013; Sigmundsdottir et al., 2014; Underhill et al., 2015). Even mutations in the GLA gene that were considered asymptomatic are associated with neuronal damage (Lenders et al., 2013). In line with these findings, cognitive deficits frequently occur in FD patients: Besides decreased health-related quality of life, which itself already constitutes a debilitating factor for affected patients, an increased risk for depression, anxiety, acute psychotic symptoms, as well as personality and behavioral changes is associated with FD (Bolsover et al., 2014). In addition, deficits in general intellectual functioning, speed of information processing, reasoning, verbal fluency and problem solving are frequent (Sigmundsdottir et al., 2014), whereas alterations of memory and attentional performance are controversially discussed: While in a study of Sigmundsdottir et al. (2014) no differences in memory and attention are reported, Schermuly et al. (2011) present evidence for deficits in the attention domain, as well as learning and memory deficits that correlate with the extent of white matter lesions. Also, FD patients can develop progressive and significant hippocampal volume loss over an 8-year observation period (Lelieveld et al., 2015). Based on these studies on the involvement of circuits responsible for attention and executive function, we for the first time investigated differences in mRNA expression in the PFC of a well-accepted FD mouse model [α-Gal A(−/0)]. An FD specific gene expression profile was discovered in murine brain samples with 381 differentially expressed genes. Of those, 135 genes were significantly up-, and 246 were significantly downregulated. Involved pathways comprised mainly immune system processes, cytokine production and cell signaling. This finding correlates well with previous studies in humans, showing that lysosomal storage disorders, and particularly FD, are associated with deficits in innate and adaptive immunity (Daly et al., 2000; Hawkins-Salsbury et al., 2011; Mauhin et al., 2015). Especially the downregulated genes in the green and blue clusters were associated with immune system related pathways (Table 4). Interestingly, age-related cognitive decline is associated with exacerbated neuroinflammatory responses in the aging brain (David et al., 1997; Viviani and Boraso, 2011; Corona et al., 2012; Farso et al., 2013; Xie et al., 2017), and the brains from aged animals show increased cytokine and chemokine levels (Bodles and Barger, 2004; Lynch et al., 2010). These might be caused by activated microglia, which constitute the major source of inflammatory cytokines and chemokines in the central nervous system (Hanisch and Kettenmann, 2007; Kettenmann et al., 2011). So far, however, microglia involvement has not been systematically explored in FD. Another cluster that emerged in our analysis was associated with DNA binding, chromatin remodeling and gene expression (Table 4, pink cluster). Several studies show that lysosomal storage disorders are associated with epigenetic changes (Hassan et al., 2017). Differential methylation patterns and decreased expression of DNA methyltransferase 3a are found in cerebellar neurons of a mouse model for presymptomatic Niemann-Pick type C disease (Kennedy et al., 2016) and Hubner et al. (2015) provide the only report on alteration of calcitonin receptor promotor methylation in FD patients on enzyme replacement therapy. Histone modifications as well as the efficacy of HDAC inhibitors have been investigated for Niemann-Pick type C (Helquist et al., 2013) and Gaucher disease (Lu et al., 2011). Regarding FD, evidence is available from transgenic mouse fibroblasts overexpressing a human α-Gal A mutation that HDAC inhibition rescues α-Gal A trafficking blockade, but without an effect on lysosomal Gb3 storage (Yam et al., 2007). Finally, another possibility of regulating gene expression is through non-coding RNAs, particularly microRNAs, and dysregulation of microRNAs occurs in the Niemann-Pick type C as well as Gaucher type lysosomal storage disorders (Queiroz et al., 2016). However, respective knowledge on microRNA dysregulation in FD is unavailable to date. Regarding the cognitive deficits, several ion channels, such as Kcnj13 or Kcnj6, and ion channel modulators were deregulated in the present screen. Some of them, e.g., Kir7.1 (Kcnj13) are critically involved in setting neuronal excitability and firing activity (Ghamari-Langroudi et al., 2015). G protein-coupled inwardly rectifying potassium (GIRK/Kir3) channels such as Girk2 (Kcnj6) are key effectors in inhibitory signaling pathways. GIRK-dependent signaling contributes to pain perception, reward-related behavior, mood, cognition and addiction (Lujan et al., 2014). In particular, several Kcnj6 “pain risk” alleles are known to date (Bruehl et al., 2013), and neuroprotective roles of GIRK channels are emerging (Sanchez-Rodriguez et al., 2017), supporting a potential contribution of Kcnj6 downregulation in the cognitive decline of FD patients with age. Few of the significantly regulated genes discovered in the present study are associated with aging- or disease-related pathophysiological changes: Neuropeptide S modulates arousal and produces anxiolytic-like effects (Xu et al., 2004; Okamura and Reinscheid, 2007), therefore the downregulation of neuropeptide S receptor (Npsr1) found in the current screen could be linked to the increased anxiety-like behavior found in FD mice (Hofmann et al., 2017). The Interferon alpha/beta receptor Ifnar1 is associated with sickness behavior and cognitive dysfunction, which frequently occurs upon Type 1 Interferon treatment in humans and in patients with autoimmune disorders (Blank et al., 2016), and lack of Ifnar1 causes Lewy Body- and Parkinson's disease-like dementia (Ejlerskov et al., 2015). The histone-binding protein Rbbp4, which was downregulated in our screen, is involved in age-related memory loss, and inhibition of this gene causes hippocampus dependent memory deficits in young mice (Pavlopoulos et al., 2013). Early life stress leads to decreased HDAC1 levels targeting promoters of plasticity-associated genes, e.g., the transcription factor Egr2, while at the same time triggering persistent impairment in working memory and attention (Adler and Schmauss, 2016). Neuronal expression of the protein tyrosine phosphatase Ptprb is involved in neurito- and synaptogenesis (Hayashi et al., 2005), and Interleukin 1 modulates hippocampal neuron function by potentiation of NMDA-induced calcium influx (Huang et al., 2011). The lysosomal cysteine proteinase Ctss and the high affinity IgE receptor gamma subunit Fcer1g, which were both downregulated in the current study, are associated with Alzheimer's disease (AD), and in particular, Fcer1g is considered as a risk factor for AD (Taguchi et al., 2005; Castillo et al., 2017). Ctss is also related to amyotrophic lateral sclerosis (ALS) (Berjaoui et al., 2015). Although ALS represents a neurodegenerative disorder that predominantly affects the motor system, cognitive decline and behavioral symptoms occur in ALS patients (Phukan et al., 2007), and mutations in Macrophage colony-stimulation factor 1 receptor (Csf1r), a gene that interacts with both Ctss and Fcer1g, causes axonal spheroids as a sign of Wallerian degeneration (Lynch et al., 2016). Csf1r, which was downregulated in our screen, facilitates protection and survival of uninjured neurons in the hippocampus and cortex (Luo et al., 2013), and Csf1r signaling via administration of Csf1 ameliorates memory deficits in an Alzheimer's disease mouse model (Boissonneault et al., 2009). Finally, Interleukin 3 has been shown to protect cortical neurons from neurodegeneration (Zambrano et al., 2007). Thus, our findings support the idea that neurodegeneration may constitute a so far neglected entity of FD pathology in the peripheral and the central nervous system. Interestingly, significantly regulated genes in the current screen were to a large extent similar to those from our recently published gene expression analysis of α-Gal A(−/0) mouse DRGs (Kummer et al., 2017). Similar to DRGs, immune system related pathways (e.g., “immune response”, “defense response”, etc.) were overrepresented. 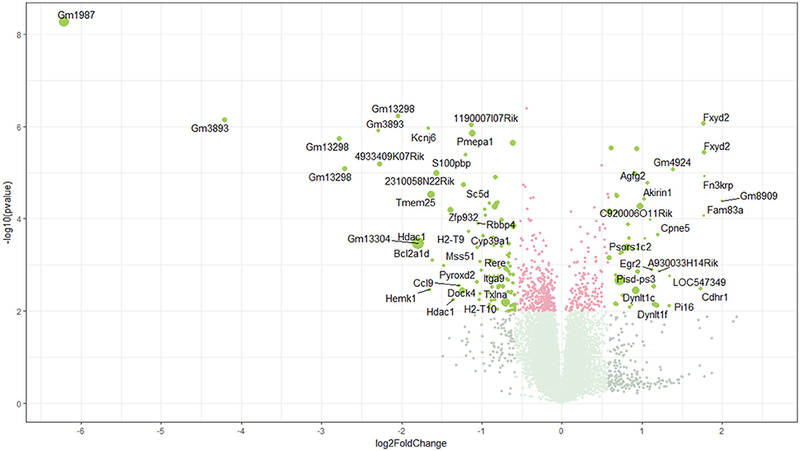 Also, the most differentially expressed genes (i.e., Pmepa1, S100pbp, Tmem25, Hdac1, Zfp932, Pyroxd2, Dynlt1c, Dynlt1f) as well as predicted genes (i.e., Gm1987, Gm3893, Gm13298, 4933409K07Rik, 2310058N22Rik, 1190007I07Rik, A930033H14Rik) were strongly regulated in both PFC and DRG samples. Altogether, 113 individual genes were significantly regulated in both neuronal tissue types, suggesting a pan-neuronal effect that might be a hallmark and the underlying cause of neuron abnormalities leading to changes in excitability and signal transduction in FD. Particularly strenuous for FD patients are the pain attacks they experience already in adolescence (Germain, 2010). In addition to the altered gene expression in DRGs, gene expression changes in relevant brain areas may play a critically important part in the development of the FD pain phenotype. Both prefrontal and sensory cortices, but also insular cortex and basal ganglia circuits are actively involved in the perception of chronic neuropathic pain (Xie et al., 2009), and white matter lesions affecting projections to these brain regions are likely involved in the amplified pain perception of FD patients. Irrespective of whether the cognitive deficits in FD are directly caused by a neuronal dysfunction due to changes in gene expression and regulation, or if they are caused indirectly by deficits in blood supply of specific brain regions, they constitute an important clinical problem. Different limitations have to be considered when evaluating the current data analysis. Although the α-Gal A(−/0) mouse model closely resembles the underlying genetics of FD patients, alternative FD mouse models have been developed, as for example the G3Stg/GLA(−/−) mouse, which expresses human Gb3 synthase (Taguchi et al., 2013), or the NOD/SCID immune deficiency mouse that also shows tissue specific Gb3 accumulation, although without clinical manifestation (Pacienza et al., 2012). It would be important to investigate if similar genes and pathways are affected in those mouse models. Also, the general moderate statistical power of gene expression screens due to the low number of tested cases—in the current experiment four per group—should be considered. Although the genotype of inbred genetically modified mouse lines can be assumed to be similar, genetic variations between individuals can exist. When performing gene expression screens in small cohorts, the probability of false positive results is high, due to the large number of multiple comparisons performed for all genes tested. Therefore, different methods of FDR (false discovery rate) corrections have been introduced for large scale genetic studies. These FDR corrections drastically reduce the number of false positively reported changed genes, but on the other hand dramatically increase the number of false negatives (Park and Mori, 2010). As a result, genes that are actually differentially expressed might be judged as not being significantly changed, and therefore might be disregarded in subsequent validation experiments. Exceedingly stringent correction of gene expression analysis over-emphasizes true positive genes and shifts the results toward a true-positive/false-negative bias. The presented analysis was designed to nevertheless provide a weighed analysis, neither overestimating false-positives, nor false-negatives, due to the moderate stringency applied. In the present screen we make use of a genetic FD mouse model to provide first knowledge on gene expression signatures and pathways other than Gb3 accumulation in central nervous system neuronal tissue that may be involved in FD pathogenesis. KK, ML and MK designed the study. KK, TK, ML and MM performed the data collection, analyzed and interpreted the data. KK and MK wrote the manuscript. TK, MM and ML critically reviewed the contents of the paper and suggested substantial improvements. All authors have approved the final version of the manuscript. Lynch, A. M., Murphy, K. J., Deighan, B. F., O'reilly, J. A., Gun'ko, Y. K., Cowley, T. R., et al. (2010). The impact of glial activation in the aging brain. Aging Dis. 1, 262–278. Copyright © 2018 Kummer, Kalpachidou, Mitrić, Langeslag and Kress. This is an open-access article distributed under the terms of the Creative Commons Attribution License (CC BY). The use, distribution or reproduction in other forums is permitted, provided the original author(s) and the copyright owner are credited and that the original publication in this journal is cited, in accordance with accepted academic practice. No use, distribution or reproduction is permitted which does not comply with these terms.